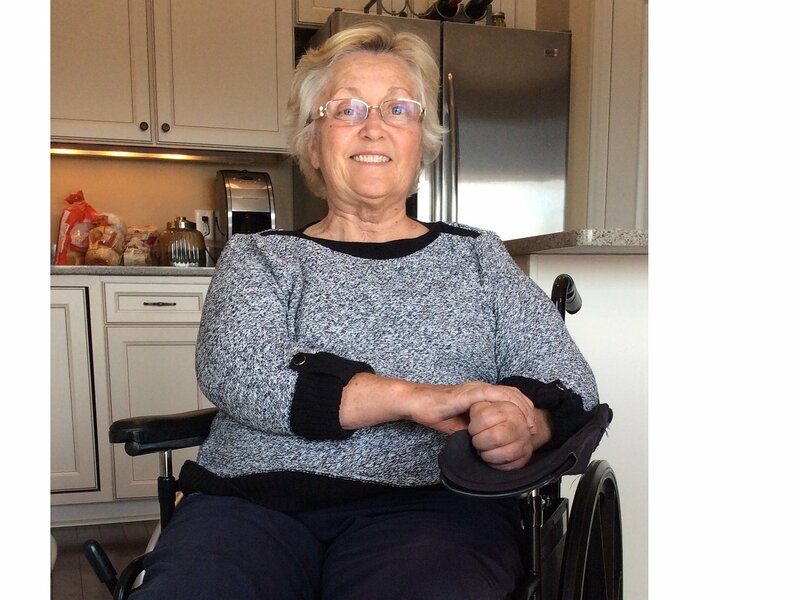 In October 2013, Ginny Hanily suffered a life-changing stroke. After an active life of raising four children and managing the family construction business, she faces a future with many obstacles due to the extensive brain injury she has sustained. Ginny nearly lost her life due to the sudden brain bleed but fought back for six months in the hospital and relearned many skills like how to eat and how to talk. Her loving husband, Pat, delegated work as best he could to keep their business running while spending hours at the hospital every day to be with her. Ginny is back home now with the ability to move her right arm but has limited use of the rest of her body. She currently needs assistance 24/7. Pat has hired a private nurse to be with her 40 hours each week, in addition to various forms of in-home therapy. Supplementary help is being sought for the weekends. A specially modified vehicle will be needed to better accommodate the wheelchair. All of these expenses are outside the parameters of insurance and must be covered privately. This fundraising campaign in her honor has been established with HelpHOPELive to help cover these medical expenses. All donations are tax deductible. Please consider a contribution. Thank you for any help you can give Ginny. Like many of you, we celebrated Mother’s Day recently. It was an excellent opportunity to watch all the kids play together (outside thankfully), catch up with each other, and take a family picture. The normalcy of it was remarkable. Less than two years ago, the reason for us to celebrate Mother’s Day in this fashion was nearly taken from us by a stroke. We sometimes forget the holes we wore in our knees praying back then. In years past, whenever I’ve asked Mom what she wanted for Mother’s Day, she would always reply, “Oh honey, just to be with the family is all I need”. Of course, we’d always get her something to plant in her yard. This year she answered the same. And, it rang truer than ever. Being with the family excited her so much, she woke up early and couldn’t get back to sleep. Even though she showed up tired, she enjoyed being around her husband, kids, grandkids, and dogs. And though it appeared normal, we didn’t get her something for her yard. Mom no longer has a yard. There are no more Spring mornings when my phone rings with her on the other end telling me to get over there to split the Hostas so I can plant more at my house. Not this year. Her house was sold. She lives in an apartment in an assisted living facility. And, she’s still fighting like hell to walk on her own again. You can tell it’s hard to do right now but comes with a huge dosage of satisfaction. It’s a reminder that we need to dust off our pants and hit the knees again. Time to lend strength is not done. We’ve also posted pictures of Mom on her bike in the pictures section on this page. I finally got a leg brace that is helpful for walking. Once I get my momentum going, I can advance my leg with no help. So, I am walking – it’s clumsy and not pretty, but it’s walking while holding onto a handrail or a cane. Before the brace, I could only walk with someone helping me. So, progress is being made on the walking front. I’m very blessed to have such wonderful friends who continue to visit on a weekly basis. And a big THANK YOU to all of you – you know who you are. Pat and the family have also been so supportive with frequent visits. I love to see the grandkids and kids. I’m going to get to some baseball and soccer games this summer to watch my grandkids play. I will also be going to Brainerd this summer for a week of relaxation and hanging with my friends. Pat will hopefully get some golf in during this time. Some of the people here are very friendly. It’s bright and cheery with a fireplace that is on during chilly, rainy days and a warm cup of jo. Many of you don’t know but the first of the year started off with a little bit of a setback. A blood clot developed in my leg – a long one. It put me in Methodist Hospital on January 1. There was much debate with the doctors about what to do. It was decided that I would go on Coumadin to combat it. From Methodist Hospital, I had to go into an assisted living facility, St. Gertrudes, in Shakopee to rehab and get stronger. I was there for a couple weeks. Unfortunately, their rehab department wasn’t up to what I was used to, so I regressed. So, Pat pulled me out of there and brought me to the Lighthouse in Waconia. The Lighthouse is an assisted living facility where I have my own apartment. The therapy here is better than St. Gertrudes but I have a ways to go to catch back up. The nice thing about this facility is that it’s central to where my family is. My kids stop over a lot and just have coffee or dinners. A lot of my friends stop by for lunch or to visit. It’s a very nice facility. I have also been out to see a movie and am looking forward to warmer weather so I can get out more. They have a nice patio here with a fire pit and seating area that looks like it will be fun in summer. I’m about the youngest in the building so I hear a lot about the old days. They really have to get more people my age in here. Anyone? Anyone? I’m still on the Coumadin and may be on it for the rest of my life. I won’t go back until April to get the blood clot checked. I also have been getting Botox shots in my left arm and hand to relax the tendons. I’m going to have to get a sleeveless gown to I can show off what will be the nicest looking left arm in town. I’m looking forward to going home and am working hard to get stronger. I’m getting used to doing things one handed but need a lot more practice. Happy New Year to everyone! Stay healthy and strong! Time for a New Year update on Ginny’s progress. Ginny showed great progress last year. Her constant attendance at therapy’s showed improvements in strength and distances she can walk with the use of a cane and a little assistance. Improvements are happening! A couple of complications have happened that we are dealing with. One is after a minor procedure she had to have after which I injured my back. Because of this we had to put caregivers on 24/7 for Ginny. Luckily we had some good people on board to help out. That doesn’t sound like a big deal but any changes are unsettling to Ginny at this stage of her recovery. The other complication happened right before New Years Day with the discovery of a large blood clot on Ginny’s left leg. After 4 days at Methodist reviewing a couple of different possible procedures she was transferred to St. Gertrude’s Skilled nursing / Rehab in Shakopee. She is still there now. Main objective is to get her strength back and get adjusted to her new medications (blood thinners). As the case has always been, we don’t know length of stay yet. Just like when we had to have 24/7 care, change is unsettling for her. She has been in St. Gertrude’s for 1 week now and she seems to be getting adjusted. We are working on the next step of the journey now. Hopefully it will be a stable living environment and more intense therapy to keep that walking distance increasing and recovery. Goals have not changed. This is the year we hopefully can report she is walking unassisted and has returned to a more normal life. Your contributions to HelpHopeLive.org on Ginny’s behalf have gone along way to helping with her recovery. She is determined to be independent again. Thank you all for your support, prayers and concern during this lengthily healing process. We thought it was appropriate for us to post an update from Mom on Thanksgiving– a day set aside to count our blessings. 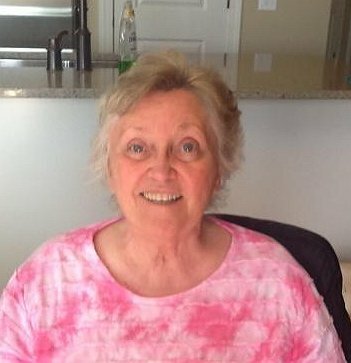 Also, for those of you who have donated or will be donating to www.HelpHOPELive.org in honor of Mom, I wanted to let you know some details about how helpful your donation is and how the funds are being used. As you may know, Mom came home at the end of April after spending six months moving from one care facility to the next as her condition changed. From the point she returned home until today, the out-of-pocket expense is just under $50,000. For 2015, the out-of-pocket expense is projected to be $110,000! Your donations help fund my Mom’s therapy which is a much needed expense on her road to recovery. She attends her therapy sessions that help her with walking, standing, and dealing with her left hand, which hurts her and hangs limply at her side. She has never missed a therapy session. She attends therapy at Methodist Hospital in St. Louis Park and at home. We are thankful that Mom has a fighting spirit. With therapy, she has a daily set of tasks she must navigate while dealing with side effects from her medications that often leave her fatigued, dizzy, and sleepless. Her attitude during this has been overwhelmingly positive. Her primary personal care attendant, Jill, helps her throughout the day while Dad is working. This arrangement allows Mom to remain home-based instead of having to stay at a nursing home. Jill helps ensure Mom’s basic needs are covered as well as getting her to therapy sessions, doctor appointments, and other personal appointments. Having Mom at home has been extremely important for us in supporting her recovery and making sure she is surrounded by her family and friends. Your donations help cover this as well. Another important way your donations help is with the medical equipment Mom needs. Who would have thought that recovering from a stroke would introduce and educate our family on so many alternate ways to perform basic tasks, from taking a shower to riding in the car? But, she has equipment to help her with all of this. The latest equipment Mom requires is a new wheelchair, one that can get through the snow better and is lighter. She is excited to start using it soon. We are thankful for all of the support we have received over the past year. Your prayers, encouragement, visits, well wishes and donations have all had a tremendously positive impact on Mom and the entire family. Thank you! Now for the update from Mom. For this update, I put her on the spot a bit and sat down with her to record it rather than letting her write it out herself. Throughout the conversation, she kept trying to think of a good holiday joke to tell. You’ll see this throughout the update though we got stuck on the punchline at the end and decided to go a boldly different way. Hope you enjoy! Happy Thanksgiving! I’m glad I’m at home to experience it this year. I’m progressing slowly, more slowly than I expected. I practice walking at home with a therapist that comes to my house twice a week. It doesn’t look pretty, but it is improving. I’m at Methodist three times a week now for therapy instead of Abbott. I’ll be concentrating next week on my gait while walking on a treadmill. This will be a new experience since I haven’t walked on a treadmill yet. Practicing the gait is important at this point in my recovery. Three elves walked into a bar. I’m feeling very well for the most part. I feel happy and healthy. My son just asked me if I wanted to talk about what life’s like without a filter. Damnit, it’s fun. I have a new wheelchair to help with getting through the snow easier. It will be nice to have one for inside and one for outside with the mucky weather: slush, ice, and salt. The new wheelchair is half the weight of my current chair which makes it easier on my caregiver. It also folds up better and is easier to lift in and out of the truck. Three reindeer walked into a bar. I also have a new foot brace for nighttime that bends my foot back a little to keep it from flopping. It helps with walking. I’ve been walking with a hemicane which is a cane that looks like a little step ladder. And I can walk quite a distance now, like across a long room at therapy (with assistance). My strength training at home is going good. Three angels walked into a bar. For the first time in a long time, I won’t be hosting Thanksgiving or holiday meals at my home. Last year, I was at Abbott for the holidays. This year is looking so much brighter. For Christmas this year, I’m thankful for online shopping instead of having to battle the crowds out at the malls. Three snowmen walk into a bar. And next year, I’ll be walking into the bar. The benefit held in my honor was a huge success. Thanks so much to Schram Vineyards for help in planning and the maiden use for their beautiful facility. Since I had the opportunity last year to taste-test each of their wines, I’m sure everyone enjoyed the beverages and had particular wines of choice. I had two favorites: the red Marquette and the sparkling. I’d say the Schrams have a great thing going and knowing Aaron and Ashley, that is sure to be improved upon annually! Thanks to the diligent planning committee of Pat Hanily, Chris Hanily, Camie Melton Hanily, Sue Leaf, Lucas Ballweber, and Emily Hanily. They met weekly to plan this event. The food was donated by Dave Burley, owner of the Blue Plate Restaurant Company. The food was prepared by the Executive Chef of the Edina Grill, Lucas Ballweber, and all was delicious! Thanks, Dave and Luke! Desserts were also scrumptious – flourless chocolate cake was prepared by Chris Hanily and the apple crisp was prepared by Emily Hanily. It’s great to have such talented bakers and chefs in the family, but dangerous too! Thank you to John and Jenny Gilbertson for the use of their tables and trailer. And, for Jenny’s expertise in decorating the tables in such a festive autumn theme. Thanks to Nick Ruehl for agreeing to MC the event. You were wonderful, Nick! Jim Lugowski, my brother and my longtime friend, Sue Leaf, spoke, remembering some things I had lost track of over the years along with much I did recall. To all those present, friends and family, what a treat it was for me to see and talk with you. Thank you, each and every one of you for all your support. Believe me when I say how much I enjoyed the evening because YOU were there. I feel blessed and thankful for all of the support our family has received throughout this past year. I just can’t thank everyone enough for everything. Thanks to my family for all your help and prayers this past year. You have sacrificed a lot and it is appreciated more than you can ever know. To Jill, my daily companion and caregiver, I am grateful for you and your compassionate ways. We found ways to laugh a lot which is so helpful in healing. To anyone I may have omitted to thank, sorry and THANK YOU from the bottom of my heart. The Lighthouse is a nice facility. I have been there a few times visiting my uncle Jimmy. Wish you the best toward your recovery. You can do it! Thanks for the update! I'll need your phone # so I can call and find a time to stop to meet for lunch! And I'll be with you walking into the bar!!!!!!!!!!!! Ginny: Looking forward to seeing you and over 70 wonderful folks Saturday evening! We honor you and support you and the family in this ongoing battle! With Love and deepest respect for your courage. May God bless you abundantly Ginny, Pat and family in your continued recovery. So anxious to see Ginny tomorrow night for our Girl's Night Out! Happy to help with this special cause.